STATE HOUSE, BOSTON, OCT. 27, 2016....Democratic legislative leaders this week urged Gov. 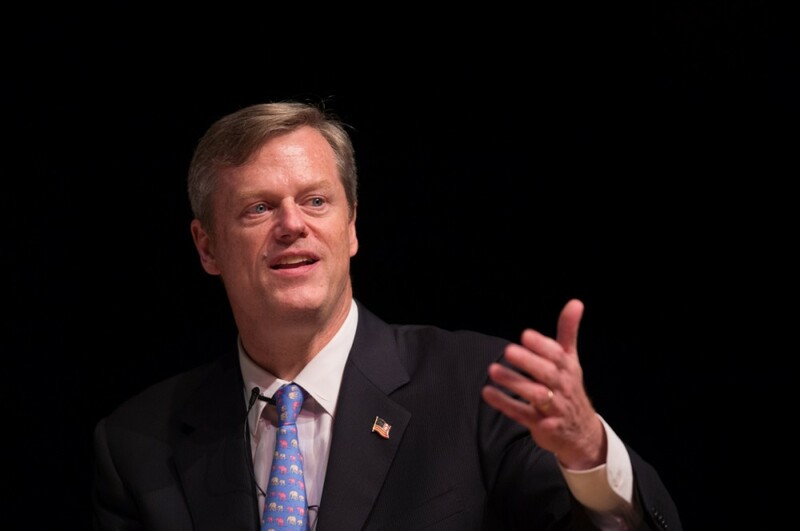 Charlie Baker to delay mid-year budget cuts and Baker aides on Thursday outlined "alternative measures" his administration would take to close a $294 million deficit without slashing spending four months into the year. Baker's budget chief Kristen Lepore did not rule out budget cuts or layoffs in the future, but informed House and Senate budget leaders on Thursday that it hoped to address the immediate budget concerns with a mix of new non-tax revenue, voluntary payroll reductions and one-time legal settlements. "We are closing the budget gap through fiscally prudent solutions such as unanticipated non-tax revenue and a voluntary separation incentive program. While we are not reducing allotments at this time, we are actively monitoring tax revenue and additional spending exposures in the coming months before finalizing our decision on the extent of allotment reductions and other actions to ensure that the FY17 budget is in balance," Lepore wrote in a letter to the chairs of the House and Senate Ways and Means Committees. Lepore in mid-October lowered revenue estimates for the year by $175 million, citing slower than anticipated sales tax growth, and projected a $294 million budget gap also attributable to underfunding by the Legislature of other accounts in the budget. The administration in July vetoed $265 million in spending from the fiscal 2017 budget, but watched the Legislature override $231 million with a net effect of $219 million on the budget's bottom line. Though Lepore said at the time that a budget solution would require a blend of "savings initiatives and spending reductions," the administration for now has backed off the idea that budget cuts will be required. Baker recently said he would prefer not to wait until January to make cuts because it becomes more difficult to trim spending later in the fiscal year, but Thursday's announcement suggested the administration is now content to wait and see how revenue collections perform over the "coming months." "I think it's a little unusual. If there's been a downgrade to tax revenue there's usually accompanying 9c cuts, but I think some of it is the administration has been managing and reducing spending without 9cs, doing it informally in a sense," said Massachusetts Taxpayers Foundation President Eileen McAnneny. Both House Speaker Robert DeLeo and Senate President Stanley Rosenberg on Monday publicly urged Baker to hold off on making emergency budget cuts, arguing that with the state only trailing revenue projections by $11 million through September it would be more prudent to wait. McAnneny said the combination of political pressure from elgislative leaders and the availability of alternatives to budget cuts might have "made it an easier call" to delay spending cuts for now. On Oct. 17, the administration opened a voluntary separation incentive program offering state employees a one-time payout to leave their jobs and reduce headcounts across government. Putting a savings target on the program for the first time Thursday, Lepore said the administration aims to save $25 million through the program. Layoffs could be necessary if that savings target is not reached through voluntary buyouts, budget officials said. Lepore said her office has also identified $92 million in new non-tax revenues by claiming higher federal reimbursements in health and humans services programs and through at least one legal settlement with Volkswagen. With the lower estimate for sales tax collections in fiscal 2017, the administration was able to remove $31 million from its spending-side ledger for the MBTA and the School Building Assistance Authority, which both receive an automatic transfer of a penny for every dollar of sales tax collected. The remainder of the gap, Lepore said, will be addressed with $145 million in "budget closing measures" that had been identified at the close of fiscal 2016, but never implemented. Those include sweeps of unnamed trust funds. "We will continue to monitor tax revenue and the spending exposures in the coming months before finalizing our decision on the extent of allotment reductions and additional actions in order to ensure that the FY17 budget is in balance," Lepore said. In addition to the underfunding of accounts for snow and ice removal and indigent defense legal services, Lepore warned of additional deficiencies, including $100 million in the MassHealth account driven by caseload increases. Though she said her team is working with Health and Humans Services to manage spending within MassHealth, Lepore did not rule out returning to some of the spending that the governor vetoed in July, monies that were restored to the budget by the Legislature. McAnneny said that she had expected to see some budget cuts to be announced by the administration, and worries that the reliance now on one-time, non-tax revenue streams and trust funds will leave fewer options later in the year should the budget problem grow worse. "It just feels like this has been more unsettled than most years," McAnneny said.